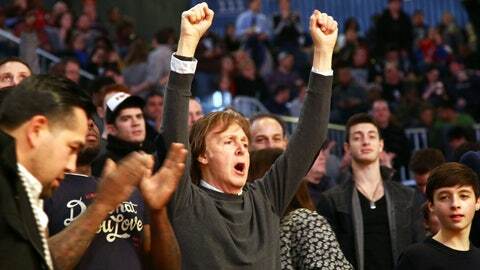 Paul McCartney was at home with the people during the Brooklyn Nets game Monday night at Barclays Center. Good luck making sense of this one. 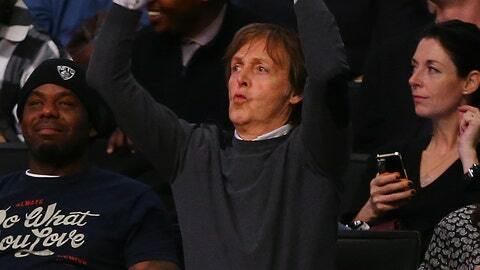 In attendance at Monday night’s game between the Philadelphia 76ers and the Brooklyn Nets at Barclays Center was one Sir Paul McCartney. For you kiddies out there, he was the lead singer of a little band called The Beatles and owns 17 Grammys. Big-name celeb taking in a game in New York? Nothing new there. Perhaps he was there to sing the national anthem. Nope. Hanging out with Nets owner Mikhail Prokhorov (a Russian billionaire) or Donald Trump (an American billionaire) on Joe Johnson’s mind-blowing night? Doesn’t look like it. And check him out. First, he calls for the shirt from whoever is presumably throwing them into the crowd. Then he calls for it like Mike Trout barreling down on a pop-up. And then when the shirt falls short and he ends up empty-handed, it looks like he tells the lucky fan, "That was mine." Not courtside, but not too shabby either. But, ever the gentleman, McCartney appears to take it all in good stride.